An original manga by Yuji Iwahara, the character designer for Darker than Black, Dimension W is a sci-fi anime that starts with an interesting concept. In the near future, people have discovered a fourth dimension, the titular Dimension W, that contains a massive supply of renewable energy. Devices called coils are invented to harness this unlimited power supply, and by 2071 a company called New Tesla Energy holds a monopoly over this technology. But when illegal coils start to appear, the company must hire special bounty hunters called Collectors to find and confiscate them. One of these Collectors, Kyoma, eventually stumbles across a path that will lead him to uncover the hidden secrets of New Tesla, and the new dimension. It’s hard not to think about the possibilities that could have been. 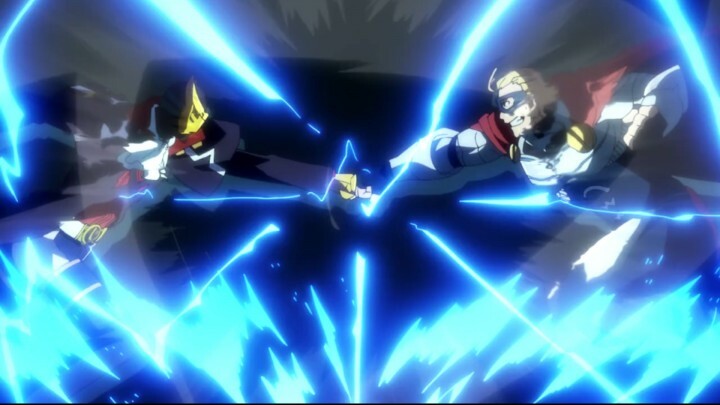 This initial pitch was all I needed to start watching Dimension W. I imagined the show would use the idea of unlimited energy to creatively break the laws of physics, following a distinctive, colorful cast through visually diverse sci-fi set pieces. Unfortunately, it only delivered on some of these expectations. It does indeed have excellent artwork that stays consistent, some brief bouts of exciting action, and more than a few unique character designs. But the poorly handled sci-fi elements and convoluted plot really detracted from my enjoyment of the series. 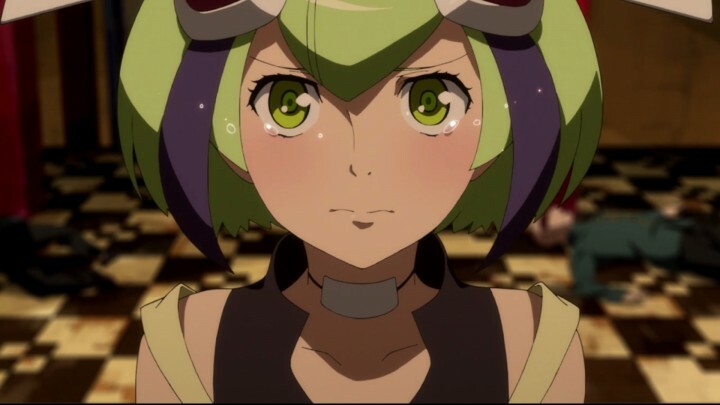 Perhaps its my own fault for going in with high expectations, but it’s hard not to think about the possibilities that could have been with Dimension W.
Dimension W wastes no time here in engaging its audience. The anime kicks off to an alluring start, with a bright pastel and neon color palette that gives off a surreal yet futuristic vibe. We’re quickly introduced to both of our main characters: Kyoma, a Collector and a luddite who hates technology, and Mira, the android “daughter” of renowned scientific genius Dr. Yurizaki, as they run into each other on one of Kyoma’s bounty jobs. 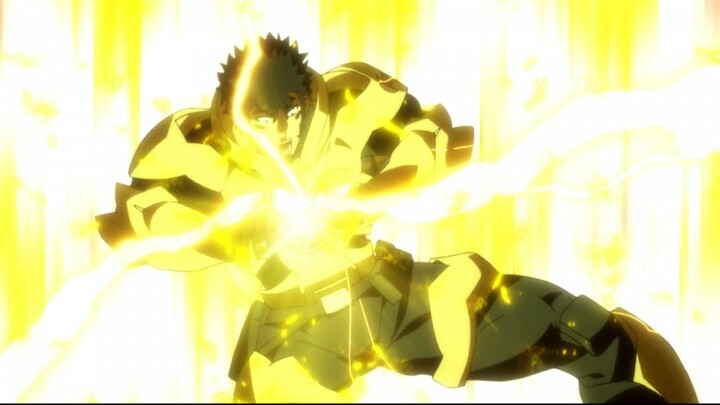 After Dr. Yurizaki appears briefly to mention a cryptic conspiracy with New Tesla Energy, he sacrifices himself in a giant explosion of coil energy. 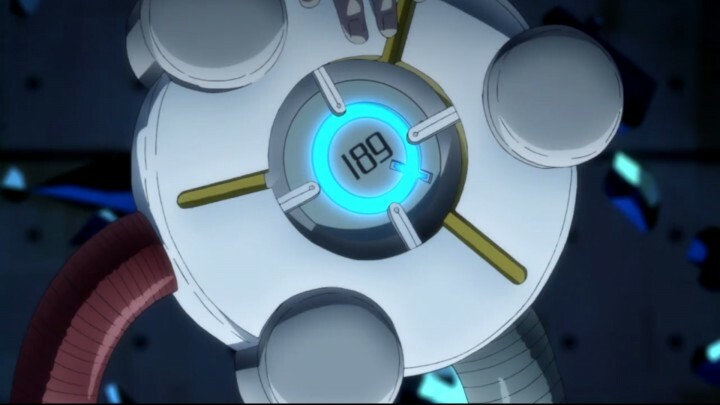 I’m definitely eager to uncover more, but since Dimension W‘s beginning has a fairly episodic structure, this plotline doesn’t serve as the primary narrative force just yet. The next episodes switch to Kyoma and Mira as a newly paired up Collector duo. There are some fun moments when they chase down Loser, an illegal coil user, with some brief but flashy fight and chase sequences. But most of the time is spent on fleshing out the two protagonists — or attempting to anyway. They actually spend a lot of time apart, so we don’t get to see much development in their character dynamics. Kyoma’s still a disgruntled guy with a mysterious past, and Mira is still the fish out of water robot girl trying to adjust to life in human society. There’s a lot of style, and potential substance, at the start. But there’s a lot of style here at the start, and the potential for a lot of substance as well. We get various hints about the gruesome truths of New Tesla Energy, as the anime has moments where it suddenly shifts to a much darker tone, like depicting horrific, dimensionally-warped distortions of body parts. Sharp cut-ins of Kyoma’s past also reveal Dimension W‘s more ominous nature. These sequences, along with some fleeting but well done action set pieces, create solid hooks to pull you further into the show. This short arc revolves around a hotel murder mystery that further reveals what the fourth dimension, and coils, are capable of. Once again, Dimension W plays around with contrasting tones, starting with a laid-back crime scene investigation that quickly changes to sudden scenes of grotesque horror. Everything, including Loser’s previous involvement, seems to trace back to the Numbers, which are special experimental coils. The concept of them is quite intriguing, but I wish there were just a few more hints given to understand their purpose or effects better. At this point, they just seem more like magical objects than scientific technology. It’s good that the anime doesn’t want to show all of its cards, but its almost halfway through the show and we only get some rapid-fire technobabble about alternate possibilities and dimensional cracks. 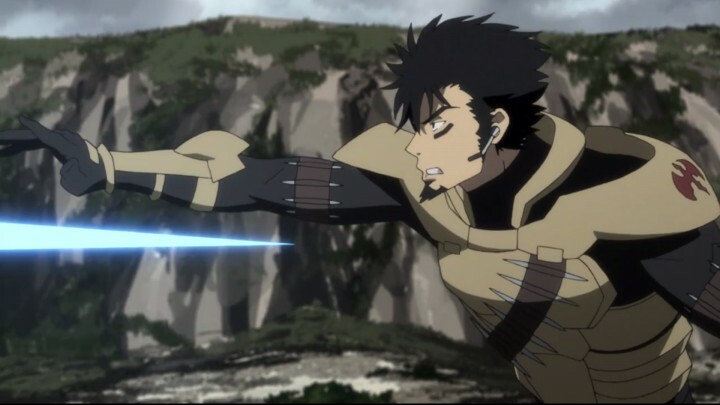 It’s also interesting how Dimension W seems to be aware that it’s been pretty stingy with the details. Mira even asks herself about who Kyoma really is, and why he hunts coils if he hates them during the fifth episode’s credits. It almost seems like the anime is telling its viewers that yes, it knows we’re eager to know, and no, it hasn’t forgotten about its more interesting plotlines. 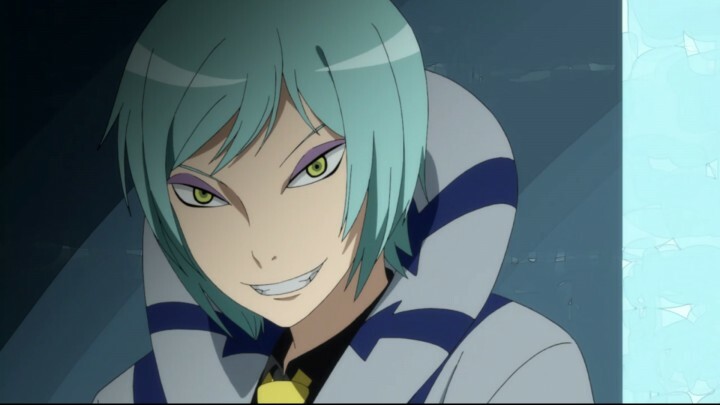 Even though we still barely know Kyoma and Mira, Dimension W introduces even more characters. Entering the scene are Salva and Lwai, the two princes of Islero. They start a race on Easter Island to obtain an enigmatic coil located there, inviting some of the world’s best Collectors to compete against each other for a huge cash prize. This seems like a promising setup for some high stakes action and much-anticipated revelations, but sadly that’s not the case. But before the main event, Dimension W finally lets us in on Kyoma’s past with a lengthy flashback. Finally, we get some insight on Kyoma and his hatred of coils — and it’s pretty predictable. I didn’t expect a big twist that would blow my mind, but I can’t say that I wasn’t disappointed by Kyoma’s paint-by-numbers backstory. It’s a shame that the coils’ dimension-bending capabilities weren’t used to craft a more creative scenario. The main antagonist’s sudden appearance feels pretty random. Then through even more flashbacks, there’s an unexpected introduction of a main antagonist. And it’s not unexpected in a “wow, I didn’t see that coming” way, but instead it comes across more like “huh, where’d he come from?” It feels pretty random, like the anime just needed a central figure to wrap all of its plot threads around. As a result, I didn’t really have much investment in him as a threat. Continuing with yet more flashbacks, we fill in more puzzle pieces about the characters’ pasts and the “incident” that started it all — but honestly it’s all still a scattered mess. The addition of some vague metaphysical dialogue doesn’t help, so it’s pretty difficult to sympathize with any character or objective. But by now, it’s evident that Easter Island is where everything started, and where everything will end — for both Kyoma and the anime’s underlying mysteries. 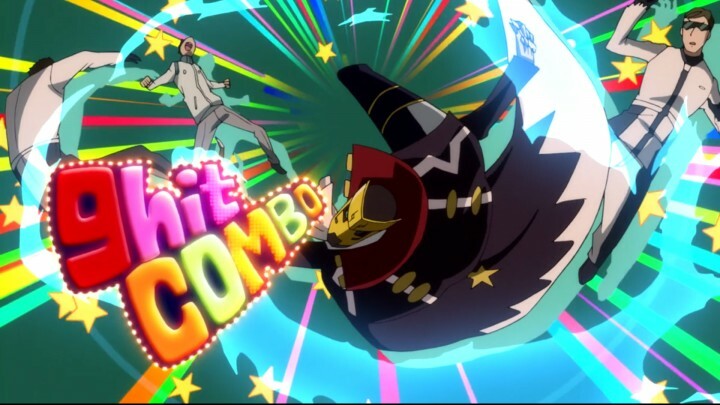 If you’ve made it this far into Dimension W, then you’re probably all in, hoping that all of this setup is worth it. The one word to describe the final episodes is “rushed.” Fights are over before they can even get started, which is really disappointing since we’re actually shown some of the Collectors’ coil-powered abilities. The anime will suddenly switch to another location or conversation in the middle of an important conflict, and then the fight’s already over by the time we get back to it. There are several parallel match-ups of clashing beliefs, ideologies, and emotions, but most of it gets abruptly deflated. The ending is also a jumbled mess, with an overuse of deus ex machina science-magic to hurriedly wrap up the show. 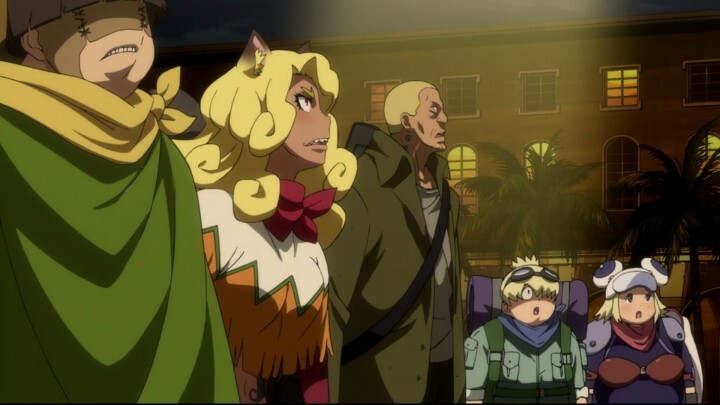 Nothing really makes sense, and things just seem to be explained away as being a result of Dimension W’s “power of possibilities.” Ultimately, the anime left me feeling unsatisfied, with a lot of lingering questions that have been open since the beginning of the show. Honestly, I really wanted to like this series. It had a very promising start that swung the door wide open for exciting experiences and a thought-provoking story. And it did provide some of that, or at least a taste of it that left me wanting more. 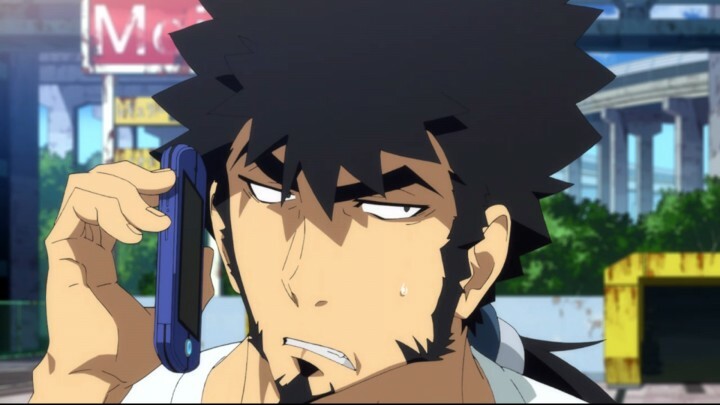 But like its own sci-fi concept, even though Dimension W is full of possibilities, it just doesn’t show us the most interesting of them.